The start of Day 2 on Live Below the Line was remarkably similar to Day 1. Attempt to switch on the kettle, remember I couldn’t afford any tea bags. Eat porridge with the other half a banana, because even if I didn’t feel like banana, I couldn’t afford to risk it going off. 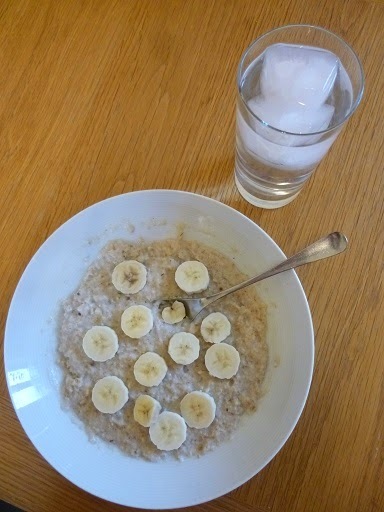 On the bright side I topped up the porridge with some extra water, and it tasted distinctly better than yesterday’s, despite only including half of one of the smallest bananas known to man. After the success of the carrot soup, I raided the bag of frozen vegetables again in an attempt to make pea soup. With no onion left, all I could do was boil up 100g of frozen peas with a value stock cube. Normally I’d thicken soup by adding potato, but with no money for potatoes I chucked in some of last night’s leftover rice. This worked so well that by the end of 15 minutes I had to dilute it with extra water. 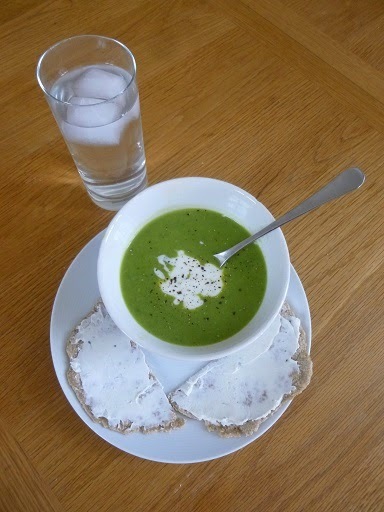 Another go with the stick blender, a dollop of yogurt for the photo opportunity, and I had something that looked remarkably like soup and tasted pretty good too. 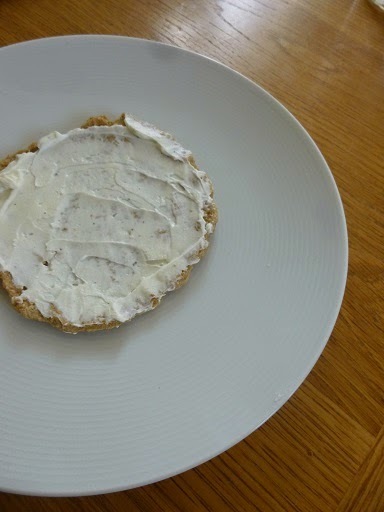 I was looking forward to more of the yogurt cream cheese but decided to go out on a limb and attempt oat flatbreads rather than a trusty piece of toast. Ceri over at Natural Kitchen Adventures had posted pictures and a recipe, so I gave it a whirl. It’s fair to say the oat flatbreads were not an unalloyed success. Luckily, I took the time to document my progress in a series of gripping oat-based photos. As instructed, I’d soaked 150g porridge oats overnight in a combination of 60ml water and 30ml of whey (the liquid that dripped into the bottom of the jar when making yogurt cream cheese, described in my blog post on preparation here.). 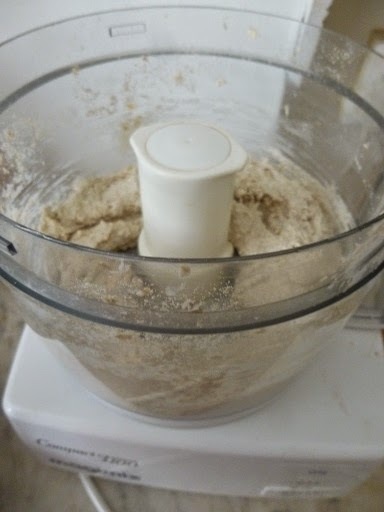 I cranked up our ancient Magimix, which reduced the pretty dry mix into something close to flour. Remarkable. 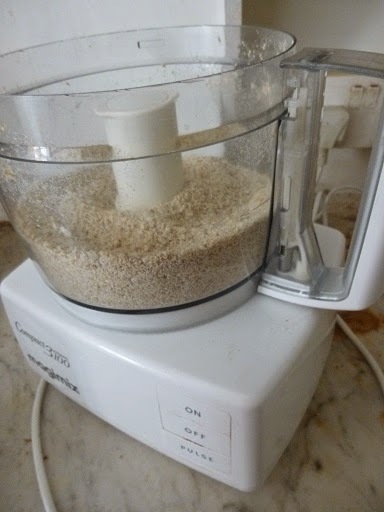 Porridge oats reduced to flour. The recipe mentioned adding water to make a sticky dough, but I bunged in too much all in one go (100ml), ended up with sloppy wallpaper paste remarkably unlike dough, added another 50g of oats, had another go with the Magimix and decided I’d just have to run with the end result. Boy, was that stuff sticky. There was no question of rolling out a ball of dough onto a piece of greaseproof paper as I was having enough trouble getting it off my hands. I put a lump straight into a hot frying pan, and tried pressing it flat as far as possible without burning my fingers. Then kept poking it and checking it and wondering “how long should it take?” and “will it ever go brown?” until I finally thought that must be long enough and took it out anyway. 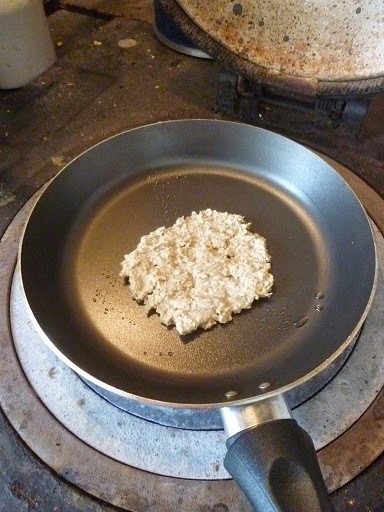 An oat-based failure in a frying plan. However, I discovered accidentally that if my hands were wet, the dough didn’t stick to them anywhere near as much. 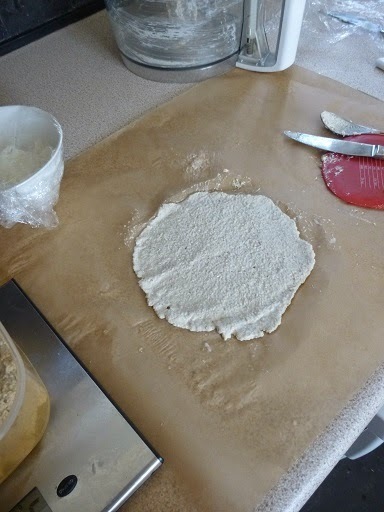 On my second attempt I successfully patted out a circle of dough onto the greaseproof paper, and then singularly failed to get it off the paper without squishing it all up again. 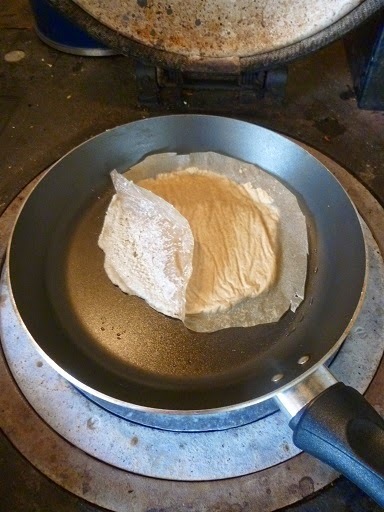 Solution: cut out the paper round the dough, upend it into the frying pan, and peel off the greaseproof paper after a few seconds, when the oat mix has started to cook a bit and it’s easier. Although I abandoned the first attempt, the next two were fine, and tasted OK with the addition of cream cheese. 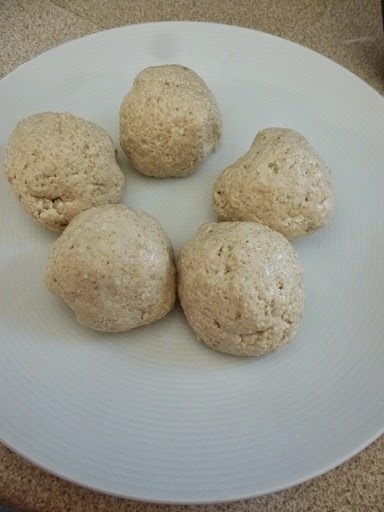 Which is lucky, because I have five more dough balls under cling film in the fridge, waiting until I feel brave enough and hungry enough to attempt cooking flatbreads again. When I was hungry mid-afternoon, I did consider trying marmalade on top of the first flatbread. 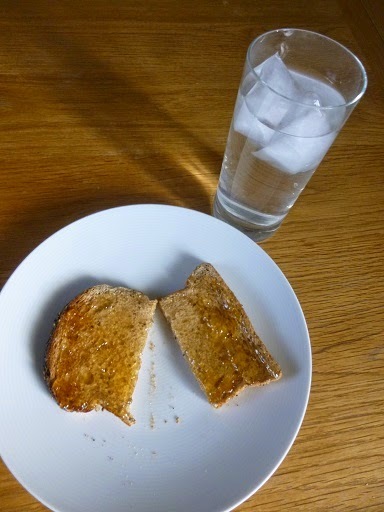 Then I chickened out and just had a slice of toast with marmalade instead. Later in the afternoon I finally cracked and opened the 27p tin of M Savers pineapple. Only on Live Below the Line could I get excited that a tin advertised with 240g of pineapple inside actually contained 320g. In fact only on Live Below the Line would I be weighing out the contents and comparing it to the official drained weight. Anyway, result! Thanks Morrisons for an extra 80g of pineapple. A small helping on top of natural yogurt tasted great. Originally, I’d just planned on having egg fried rice for dinner. 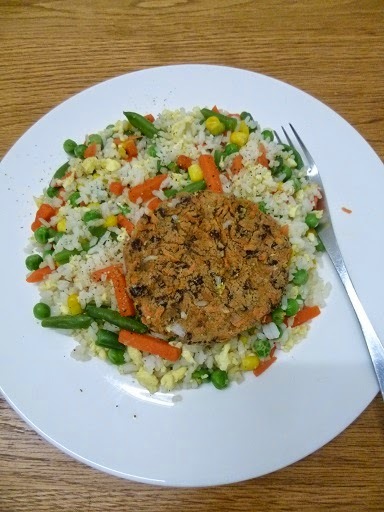 Then I realised I could snaffle 40g of the kidney beans destined for 2 days’ worth of chilli, grate up some of my single raw carrot, add a dash of cumin from the store cupboard and ta dah: an approximation of Jack Monroe’s Carrot, Cumin and Kidney Bean Burger. The real recipe is here, and also in the “A Girl Called Jack” cookbook. The real recipe also adds onion, flour, shedloads more kidney beans and fresh coriander. I cook them even when I’m not doing Live Below the Line, and they taste excellent with lettuce, tomato and mango chutney served in a wholemeal roll. I didn’t have any of those extra ingredients, so I ate it with last night’s leftover rice fried up with boiled mixed frozen vegetables, a tiny bit of grated ginger, and an egg stirred through until it was cooked. It was fine. I’m sure 150g of boiled veg is good for me, but it tasted a bit watery and really needed a glug of soy sauce to liven it up. Total for 3 meals and 2 snacks today was 89p. 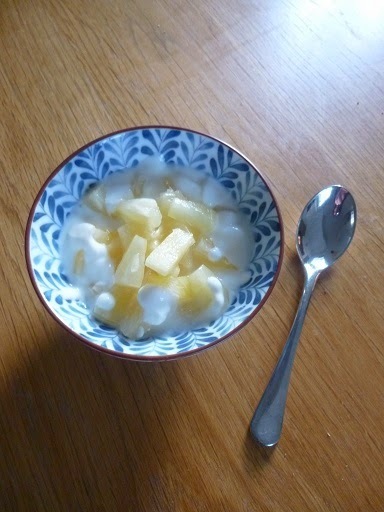 I was hungrier today than yesterday, and glad I’d shoehorned yogurt into the budget as an extra snack. My evening meal was reasonably filling, but the fried rice didn’t taste of much. 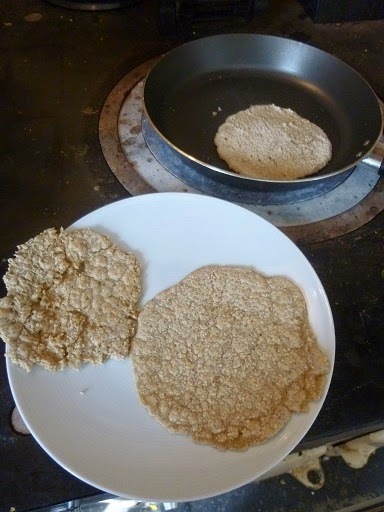 I’m glad I had a go at making oat flatbreads, as I love trying new recipes. I’m also well aware that my attempts at low cost living involved literally hundreds of pounds of appliances – a microwave for the porridge, a stick blender, the Magimix (however ancient), a fridge, a freezer, a hob, a toaster and kitchen scales, let alone the basic kitchen equipment like frying pans and graters. I may have managed to feed myself for 89p today, with all this and more at my disposal, but it would be unthinkably harder for the 1.2 billion people worldwide living below the poverty line. I've got no oats or I would have given these flatbreads a try!! Are you finding that you're spending a lot more time in the kitchen AND making a lot more pots to wash? I ran out of time completely with yesterday food prep and photographing it all on top of my usual day to day jobs!! You're doing well though, I'll keep coming back for inspiration. Oh and I meant to add, soak your oats in the water you are going to cook them in overnight in the fridge, they will be much, much creamier tasting and will need less milk adding to them. Yes! So much more washing up. I even took a photo this morning of the pile of washing up, I'd create so much attempting oat pancakes & some syrup. Thanks for the top tip on porridge, I'll give it a whirl.